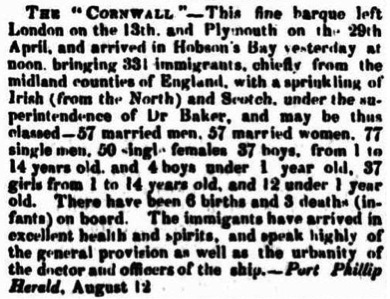 Esther was one of 278 “assisted” immigrants on the barque “Cornwall” which sailed from Plymouth on 28th April 1848 and arrived in Port Phillip on the 11th August 1848. The ‘Nominal List’ of the passengers on the “Cornwall” listed her as Esther Ferris, a laundress aged 64, from Bath. Her religious denomination was Episcopalian, and she could neither read nor write. The ‘Disposal List’ added that her employer was J. Godber, of Collingwood (a friend). ‘Assisted’ immigrants had their passage paid for by the government or an employer. To be selected, prospective immigrants were required to be young, industrious, of good character, and have the working experience and skills that were needed in the colony. At a time when the average life expectancy in England was only about 40, Esther was obviously far too old to fit the first criteria. For a long time, I assumed that she must have been recorded as a ‘laundress’ just so she could accompany her two daughters and their husbands and children to Port Phillip. This was not actually the case according to Florence Chuk in her book “The Somerset Years”. Instead, the family had to pay £13-9-6 to enable Esther to accompany them here. That was pretty much a year’s wages for many people at the time so must have been quite a challenge for the family to raise! I’m glad they did. Travelling in steerage for 104 days on an emigrant ship and setting up home again in a new country would have been far from easy but, at least, Esther had her family with her. Esther, the daughter of Samuel and Mary Chancellor, was born about 1784 and grew up in Stanton-Drew, Somerset, England. She married Robert Ferres, a printer, in St James, Bath on 26th August 1809. They had 6 children: Robert: 1810-1812, Hannah (Anna) 1812-1895, Eliza Bridget 1814-1882, Jane 1816-1847, John 1818-1898, William 1821-1825. 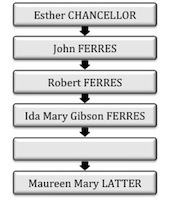 Tragedy struck Esther’s family on the 26th of March 1822, when her husband, Robert Ferres died (aged only 35) leaving Esther to rear 5 children aged from 9 months to 10 years on her own. How she managed this is unknown. Perhaps that is when she became a ‘laundress’? However it happened, Esther managed to raise her four remaining children into adults who could all read and write. John trained as a printer in Bath and ran his own business. Sadly there were many other losses in Esther’s family. Her eldest child, Robert, had already died, aged 2, in 1812. Her baby, William, died just three years after his father, in 1825. Jane’s only daughter Elisa (Brain) died one week after birth in 1840. Eliza’s son George (Cooper) died in 1845 at the age of 7 months. Jane, herself, died on 26th December 1847 and John’s wife, Julia on 17th April 1848. No wonder the family were tempted by the prospect of a better life in Melbourne and the wider Port Phillip area. The voyage, itself, appeared to go well. Newspapers reported that the immigrants: “have arrived in excellent health and spirits, and speak highly of the general provision as well as the urbanity of the doctor and officers of the ship”. Unfortunately, of the 3 deaths on board, one was her grandson William Cooper who died on 4th May 1848. Better news was the birth of a granddaughter Anna Francis Cooper on board ship in Hobson’s bay, Melbourne on 11th August 1848, the day of their arrival! Esther appears to have settled with her daughter Anna Wilton (and her husband William) in the ‘River Jack’ area of Alberton where she died of ‘general decay’ on 23rd June 1865, aged 81 years. She was buried on 26 June 1865 in the Alberton General Cemetery. When and where was Esther born and baptised? When and where were her parents married? Was her mother a Mary Chamberlain from West Perman, Somerset as her son John wrote in 1875? Or was it West Pennard? How did Esther manage to support her family after she was widowed? How could she have afforded John’s apprenticeship costs? Was the William Chancellor (son of Samuel and Mary) baptised in Stanton Drew on 20 Jan 1788 her brother? What was Job Godber’s connection to the family? Chuk, Florence (1987). The Somerset years : government-assisted emigrants from Somerset and Bristol who arrived in Port Phillip/Victoria, 1839-1854. Pennard Hill Publications, Ballarat, Vic. I really like the way you have set this out, especially with the future research questions and the diagrammatic link back to you. I am tempted to take part in this challenge but have already committed to another which I feel will be a challenge. Perhaps I should just try. I might “borrow” your ideas here. Thanks Shannon for your interest. I am using the future research questions as a sort of organiser for myself so that when I return to researching a particular person I have a direction to follow. The diagrams were made in Word using the Smart Art, process templates. There are lots of ways you can modify them. When I am satisfied with one, I just take a screen shot and save it as an image to insert in the post. Easy!